There are literally hundreds of over-the-counter whitening treatments available in the marketplace, including whitening strips and bleaching toothpastes. Many of the products are ineffective and may not produce the desired results. The Rembrandt® teeth-whitening system combines the power of a "Sapphire" Plasma Arc Light with patented teeth-whitening gel in order to brighten teeth by eight to 10 shades. Rembrandt® teeth-whitening takes approximately one hour to complete in-office. Our office also offers an at-home option with custom-fitted trays. 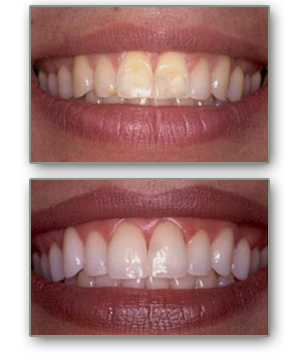 The trays can whiten teeth in as little as a few days. However, most treatments require a few weeks in order to achieve the desired effects. Whether you choose the Rembrandt® teeth-whitening system for in-office or at-home, you can be assured of dramatic results. As with any whitening system, the post-treatment results can vary according to the degree of staining and the condition of the teeth. A consultation with Dr. Simone prior to treatment will provide you with information about the kind of results to expect from Rembrandt®.